More details are coming out... And we're loving it! So, tell us about your weekend... Did you, maybe watch the most romantic thing to happen on television. Prince Harry and Meghan Markle's royal wedding took place on May 19 and we're still reliving every fairytale moment. And it would appear so are the guests. Keeping their identity hidden, a few lucky souls are sharing what the wedding of the year really was like. And holy moly, can some Marty McFly us and take us back to that day? Here are the most exciting new discoveries from Meghan and Harry's royal wedding. We all know who was really running the show! We always knew Princess Charlotte reigned as one of our favourite royal cuties. But now we know she's the queen of keeping everyone in line. The three-year-old is secretly the woman who ran the show for her Uncle Harry and new Aunty Meghan. The royal was one of six bridesmaids. One guest shared that behind the scenes, Prince George's little sister was the child whisperer. "She was really sweet," a royal wedding guest told People. The sweet tot also got some help from her Nanny Maria Borrallo to help with the six bridesmaids and four page boys including her brother, Prince George, Brian, John and Ivy Mulroney, Zalie Warren, Florence van Cutsem, Remi and Rylan Litt and Jasper Dyer. "I was sitting right in front of [Maria] and she was bribing the youngest bridesmaid with Peppa Pig and Smarties," the guest shared, admitting, "it was quite funny." Seeing young Charlotte shine is no surprise. Her proud parents have described their second-born as "extremely chatty". "She is very cute but has quite a feisty side. George has turned out to be a lovely little boy. I hope he will keep Charlotte in order," Duchess Catherine has said of her only daughter. 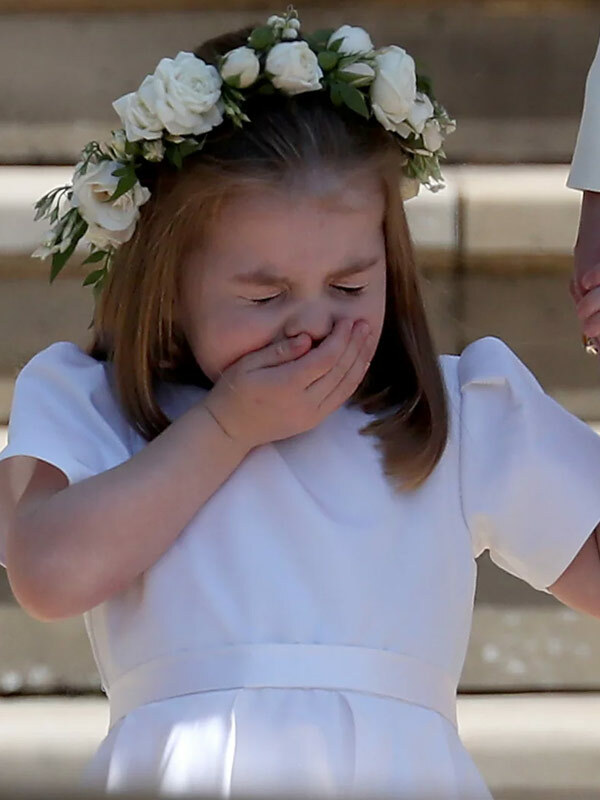 It was a "blink and miss it" moment but little Princess Charlotte made us all coo "Aww" when she had a little sneeze. It happened while the Princess was holding her mum, Duchess Kate's hand, walking out of St George's Chapel. The pair were standing on the steps looking at the crowd when she let out a little "Ahh-choo!" The sweet three-year-old still managed to keep her royal wave in place, making the whole thing very adorable! We know where she gets her cute sneeze from! It's been just one month since Prince William and Duchess Kate welcomed their third child Prince Louis. And the couple are 100% still in their babymoon. Apparently, at the reception the duo really let their hair down. "William was in a jokey, wonderful mood at the party," a royal wedding guest told People. "He must have been relieved that it wasn't all about him." Another shared, "He is so proud of his brother!" And Kate was in proud mum mode after watching her two little ones wow at her brother-in-law's big day. "She was [in] great form," the wedding guest recalled. "She and William were saying how thrilled they were to have their children there taking part." Well this is a little saucy! One well-placed insider dished to Us Magazine that the newlyweds left their second wedding reception at Frogmore House before it had officially ended. "They let themselves have a few drinks, then they were ready to get back for some rest," the pal revealed. To be fair, it had been a very long day - with Meghan needing to begin her preparations from 6am! The evening affair, which saw 200 of their close pals attend, seemed like a wild party. Apparently George Clooney, attended with wife Amal Clooney, stepped in as bar keep, serving drinks made with his own Casamigos tequila. While Idris Elba had everyone grooving, getting behind the DJ booth. "It got rowdier as the night went on!" Somebody, please share a photo from inside! We've got our eyes peeled on Meghan's friends, who broke royal protocol by sharing a few sneaky snaps!